I am excited to announce a digital photo/video camera drive for AIDESEP, the umbrella organization for indigenous peoples of the Peruvian Amazon. This camera drive was first envisioned while conversing with Daysi Zapata, who has recently re-assumed the role of Vice-President of AIDESEP after the return of President Alberto Pizango from exile. Daysi had been invited to speak at a public event hosted by NYU's Center for Latin American and Caribbean Studies, which is how we met. During her presentation, Daysi expressed the need to be able to counter the negativity toward indigenous peoples which she says is currently dominating the Peruvian media. She knows that AIDESEP and the indigenous peoples of Peru have many supporters around the world, and is eager to find ways to engage them in the present struggle over land rights. 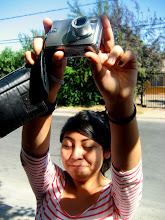 If you have a digital camera that you are no longer using--photo or video--please consider donating it to AIDESEP. You can also donate cords, batteries / chargers, and memory cards. You can either arrange to meet with one of the coordinators of this camera drive located in Brooklyn, Houston, Chicago, San Francisco, Phoenix, and Philadelphia, or ship it directly to Brooklyn, NY. If interested, write to donate.cameras[at]gmail.com. The goal is to collect 20 functioning cameras by January 15, 2011. AIDESEP will use the cameras for a variety of purposes and projects. They will be useful in documenting the current changes occurring in the Amazon. Cameras will help the organization show the rest of the world not only the challenges indigenous peoples are facing, but also aspects of their livelihood they would like to protect. 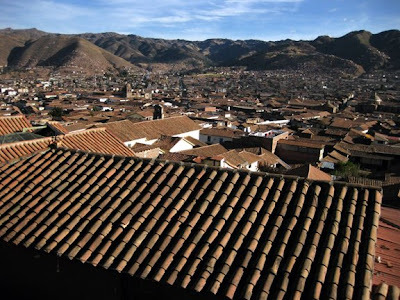 AIDESEP leaders are planning to use photography and video to educate Peruvians as well as the international community about their ways of life and cultural practices, which will help foster understanding and respect. Cameras will also enable local peoples to produce coverage of events which will diversify the media and represent different perspectives on issues. As explained on its website, AIDESEP represents about 350,000 indigenous peoples who live in 1,350 communities, among whom 16 languages are spoken. AIDESEP writes that "somos una organización moderna que defendemos nuestra propia identidad, reconociendo sus fortalezas y combatiendo sus debilidades. De esta manera buscamos consolidarnos democráticamente como sujetos activos del cambio y así ser un testimonio del cambio que queremos ver en el mundo." Translation: "we are a modern organization defending our own identities, recognizing our strengths and combating our weaknesses. In this manner we look to democratically consolidate ourselves as active subjects of change and be testimony of the change we want to see in the world." Daysi explained how in the past, AIDESEP has nurtured diplomatic relationships with the Peruvian government, resolving political friction through conversation and compromise. Unfortunately, the Peruvian government has not pursued this course of action in the recent past. Peruvian President Alan García's vision of development for Peru includes opening up large amounts of the Peruvian Amazon to transnational mining, logging and drilling companies, but indigenous peoples living on the land disagree with this kind of development, arguing that not only will it endanger their ways of life but will irrevocably damage the Amazon. In her presentation, Daysi said that García did not consult indigenous peoples about recent laws that he has passed which allow him to sign away land in the Amazon. García claimed that these reforms were necessary in order to comply with the recently signed Free Trade Agreement between Peru and the US. In an effort to make their opinions known, the communities of the Peruvian Amazon decided to stage a series of rallies and peaceful protests in mid-2009. For about two months, thousands of people of all ages stood in the road, blocking traffic through the Amazon to make clear their opposition to García's decrees and the FTA. García ordered the road cleared by force, sending in the national police to disband all participants. The resulting clash near the town of Bagua produced multiple fatalities on both sides. Daysi firmly expressed AIDESEP's disagreement with the use of violence to resolve this conflict over land rights. She also conveyed a strong sense of determination to defend the land and livelihood of the peoples of the Amazon. Photo and video cameras will help AIDESEP better fulfill their media and communications plans. Cameras will help the organization connect to the international community, create valuable material to educate lawmakers and the public, and monitor any threats to human rights. 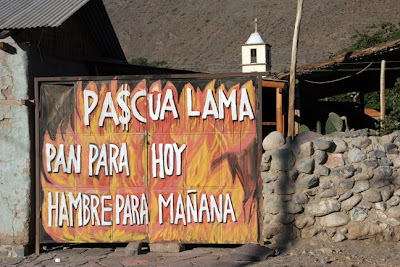 There is a wide variety of information that has been written in English about the current situation in Peru, a lot of which is in response to the clash at Bagua. For those who speak/read Spanish, AIDESEP's website is a valuable resource. Also, Witness.org, an organization that promotes the use of video to raise awareness of human rights violations, published an article about AIDESEP and the use of digital media to help document what happened in Bagua and the struggles over land rights involving indigenous communities and the government. This informative article is a strong argument for increasing AIDESEP's access to digital media, showing how valuable more cameras could be for the organization. You can read it here, and learn more on the Witness website. Here is a recording of Daysi Zapata speaking before the US Congress in April 2010, a couple of days before presenting at NYU. Again, if you have a digital camera that you are no longer using--photo or video--please consider donating it to AIDESEP. You can also donate cords, batteries / chargers, and memory cards. You can either arrange to meet with one of the coordinators of this camera drive located in Brooklyn, Chicago, San Francisco, Phoenix, and Philadelphia, or ship it directly to Brooklyn, NY. If interested, write to donate.cameras[at]gmail.com. The goal is to collect 20 functioning cameras by January 15, 2011. Please forward this article to others who may be interested. Thanks. Estoy emocionada para anunciar una campaña de cámaras fotográficas y vídeos para AIDESEP, una gran organización que representa todos los pueblos indígenas de la selva Peruana. Esta campaña de cámaras fue concebida durante una conversación con Daysi Zapata, quien recientemente retomó la posición de Vice-Presidenta de AIDESEP después de que el Presidente Alberto Pizango regresó de su exilio. Daysi y yo nos conocimos cuando fue invitada a presentar en un evento público por el Centro de los Estudios Latinoamericanos y del Caribe (CLACS) de la Universidad de Nueva York (NYU). En su presentación, Daysi expresó la necesidad de cambiar la imagen negativa de los pueblos indígenas que está saturando la prensa Peruana. Ella sabe que AIDESEP y los pueblos indígenas tienen apoyo de la comunidad internacional, y está interesada en involucrar a esta comunidad en la lucha sobre los derechos territoriales. Si Ud. tiene una cámara digital que no está ocupando--de fotografía o de video--por favor dónala a AIDESEP. 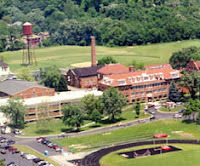 Ud. puede donar cuerdas, pilas / cargadores, y tarjetas de memoria también. Personsas tambien pueden coordinar con una coordinadora de la campaña ubicado en Brooklyn, Houston, Chicago, San Francisco, Phoenix y Philadelphia, o la pueden enviar a Brooklyn directamente. Si tiene interés, por favor escriba al donate.cameras[at]gmail.com. Nuestra meta es tener 20 cámaras que funcionan antes del 15 de enero 2011. AIDESEP usará las cámaras para una variedad de proyectos. Sean útil en documentar los cambios que están ocurriendo en las Amazonias Peruanas en esta época. 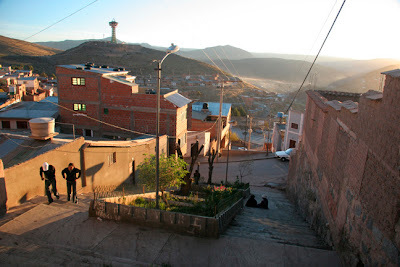 Las cámaras ayudarán a la organización en mostrar el resto del mundo no solo las metas en frente de los pueblos indígenas, pero también aspectos de sus modas de vivir que requieren protección. Los líderes de AIDESEP están planificando usar la fotografía y video para educar los Peruanos y la comunidad internacional sobre sus vidas y cultura, para fomentar comprensión y respeto. Las cámaras permitirán que la gente local cubra los eventos que afecten sus vidas. Esto diversificará la prensa y representará más perspectivas sobre los asuntos. Como está explicado en su sitio de web, AIDESEP representa más de 350,000 personas indígenas quienes viven en 1,350 comunidades y hablan 16 idiomas. AIDESEP escribe que "somos una organización moderna que defendemos nuestra propia identidad, reconociendo sus fortalezas y combatiendo sus debilidades. De esta manera buscamos consolidarnos democráticamente como sujetos activos del cambio y así ser un testimonio del cambio que queremos ver en el mundo." Daysi explicó que en el pasado, AIDESEP había construído relaciones diplomáticas con el gobierno Peruano, buscando soluciones para la fricción política con conversación y compromiso. Desafortunadamente, el gobierno Peruano no ha seguido este curso de acción recientemente. El Presidente de Perú Alan García tiene una visión de desarrollo para el país que incluye abrir gran porciones de las Amazonias Peruanas a las compañías transnacionales de minería, perforación y petróleo. Pero los pueblos indígenas que están viviendo en la zona no están de acuerdo con este tipo de desarrollo; ellos discuten que no solo se lo pondrá sus modas de vivir en peligro pero también lo dañará irrevocablemente la Amazonia. En su presentación, Daysi dijo que García no ha consulado los pueblos indígenas sobre leyes recientes que han pasado que les permiten abrir tierra de las Amazonas para las compañías transnacionales. García ha reclamado que estas reformas son parte del Tratado de Libre Comercio Perú - Estados Unidos recientemente activo, un acuerdo que tomó muchos años en desarrollar pero que recibió las firmas finales al final del término del Presidente de los EEUU Bush en 2009. Para promover sus opiniones, las comunidades de las Amazonas Peruanas decidieron preparar una serie de manifestaciones pacíficas en la mitad del 2009. Para casi dos meses, miles de personas de todas edades se pararon por la autopista principal, bloqueando el tráfico de las Amazonas para hacer claro su oposición a los decretas y el Tratado de Libre Comercio. García los ordenó que terminara, enviando el policía nacional para disolver los participantes. Este conflicto, cerca del pueblo de Bagua, produjo fatalidades por ambos lados. Daysi expresó firmemente que AIDESEP no está de acuerdo con el uso de violencia para resolver este conflicto sobre derechos territoriales. También ella demostró una determinación fuerte para defender la tierra y los pueblos indígenas de las Amazonas. Las cámaras de fotografía y video ayudarán a AIDESEP hacer sus planes de prensa y comunicaciones. Las cámaras ayudarán a la organización en conectar a la comunidad internacional, en crear materiales importantes para educar legisladores y el público, y en vigilar amenazas a los derechos humanos. Hay una gran variedad de materiales en el internet de este tema. Obviamente, el sitio de AIDESEP es un gran recurso y un paso importante para empezar. Aquí hay un video de Daysi Zapata hablando en frente del Congreso de los EEUU en Abril 2010, algunos días antes de su presentación a NYU. Por favor, si pueda enviar este artículo a los individuales con interés sería muy genial. Gracias. Outside of the Central Market in Cusco, a throng of people slowly marched through the otherwise empty street, most traffic suspended for the day. They chanted “Urgente! Urgente! Nuevo presidente!” Some beat on drums, others blew horns. 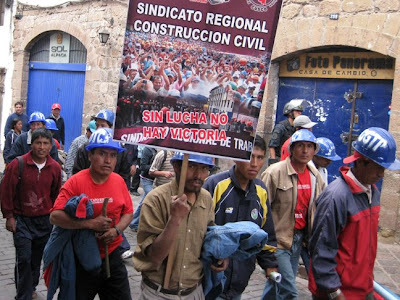 On July 8, 2009, unions across Peru organized a national strike (paro). After several conversations with various Cusqueñans, and after reading newspapers and the wall of information posted for public display, I understand that participants used the strike to voice a quantity of grievances against the current president, Alan García. I spoke with a municipal worker in the Plaza de Armas named Sylvester (left). In his opinion, “the platform of the fight is [that] our Peruvian government wants to privatize our natural resources, riches, and territory that had been adjudicated as part of the state.” Referencing a nationwide economic crisis, he condemned the Free Trade Agreement with the United States, claiming that it “doesn’t benefit us, the people of lesser resources; [it] only benefits those higher up [like] business owners.” Sylvester highlighted another point of the strike to be the nationalization of the factories, explaining that “before they belonged to the state but now they have been privatized. We want them to be nationalized, and not in the hands of international companies” (my translation). 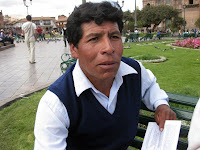 While not all were in accordance with the strike, many groups spoke out in Cusco. Of what I witnessed, protests were generally peaceful, with a massive number of police keeping watch throughout the city. 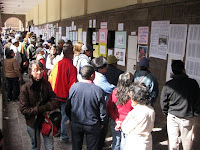 In addition to unions marching through the streets, a large collection of posters and pictures lined the stone wall of one of the main buildings along the Plaza de Armas. I heard both that law faculty from a university had posted the information as well as local writers. There were also large sheets of blank paper taped to the wall on which the public was encouraged to write their opinions on topics ranging from the privatization of water to Alan García’s relationship with the United States. While I have read that the strike was not as widespread as some had hoped, I understand that it is probably not the last that we will see. To see more photos of this day, visit flickr. 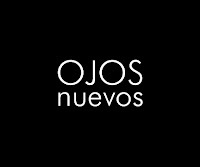 OJOS nuevos began in Santiago de Chile in the fall of 2006. While the workshops still continue in the southern hemisphere, we are about to expand to include a new location: Chicago. Planning for a May start, workshops will be offered to a small group of adolescent women in collaboration with La Casa Central Community Center which is in Chicago's Humboldt Park neighborhood. Stay tuned for updates!